Patrick Hruby: Voices of ... America? The voice on the line was warm, proud, reassuring, a voice that holds your hand and looks you in the eye. The voice on the line is disdainful, incredulous, slightly sneering, a voice that rolls its eyes and spits in your soup. Two voices, representing two competing visions for partisan America? Not quite. Both voice belong to Dude Walker, a New York-based professional voice actor who frequently does political advertising work. “You can say the exact same line different ways, and it can mean different things,” he said. With the electoral calendar nearing its climax — and a close presidential race coming down to a handful of hotly contested swing states — ‘tis the season for campaign ads. And with a deluge of messaging, positive appeals and vicious attacks, all aimed at persuading, well, persuadable voters, each spot needs a voice. According to Kantar Media’s Campaign Media Analysis Group, campaigns and outside groups are expected to spend more than $3 billion on television ads alone this year — up from $2.1 billion in 2008 — while battleground-state cities such as Las Vegas reportedly have been bombarded by more than 73,000 spots. The upshot? People in Mr. Walker’s line of work are really, really busy. Though voice-overs are less celebrated, they are no less important. If an ad is comparable to a restaurant dish — a meaty attack, a side of factoids, a catch-phrase garnish — then voice-overs are like salt. Too much, and you notice. Too little, and you also notice. Just right? You focus on the food. At the University of California at Los Angeles, Tim Groeling teaches a political advertising course in which students are required to produce their own spots. “It’s deceptively difficult to get a decent voice-over,” said Mr. Groeling, chairman of UCLA's Department of Communications Studies. “That’s something my students often have trouble with. It’s amazing how bad a commercial can be with the wrong voice. It kills. Takes the audience out of the moment. While political voice-over work might seem decidedly less nuanced than, say, a performance of “Hamlet,” the truth is that there is an art to proclaiming how Mitt Romney would ship your grandmother’s wheelchair to China for a few extra pennies in outsourcing profits, or how Mr. Obama’s economy is akin to “The Road Warrior,” albeit with fewer dune buggies. Compassionate: Softer, heartfelt vibes for a kinder, gentler candidate. Vote for me, and I will build this orphanage, then personally hug every child inside. Patriotic: Positive and prideful. A vote for me is a vote for the greatest nation on Earth. And bald eagles. The disenchanted voter: The truck driver or small-business owner who is fed up with Mr. Inside-the-Beltway incumbent. Bitter and angry. But also weary. And maybe even pitying. Poor President Obama. We gave him a chance. The attack: Go for the jugular. Al Gore invented the Internet. My opponent is history’s greatest monster. Speaking of attack ads, Mr. Groeling has noticed a trend of employing female voice actors for the most aggressive and negative material. A former Young Republican and GOP county chairman in suburban Detroit, Mr. Smith got his start in 1974 when a media consultant for Michigan Gov. William G. Milliken asked him to be the second actor on a two-voice commercial. The consultant liked Mr. Smith’s warm, inviting, authoritative voice, which oozes Midwestern authenticity. He hired Mr. Smith to do more campaign work, including spots for the governor of Ohio. Mr. Smith has worked for Republican candidates and causes ever since. Indeed, the nation’s partisan divide isn’t limited to the Electoral College map. Mr. Walker and others in the industry say voice actors generally have to choose between working exclusively for Republicans or only for Democrats. The bifurcation reflects, in part, branding concerns — specifically, the concern that hearing the same voice savage Mr. Romney one day and Mr. Obama the next will introduce an element of cognitive dissonance, undercutting an ad’s message. “It’s hard to play both sides,” said Mr. Walker, who once worked for both parties but now sticks with Democrats. “When I’m working with the [Democratic National Committee], recording a national or regional commercial, the last thing they want to hear is my voice on an ad for a Republican congressman in Ohio. Like Mr. Elliott, Mr. Douglas isn’t picky about his clients. A self-described liberal who “hugs trees without their consent,” he nevertheless works for Republicans and Democrats alike. His key? Having a sense of humor. “I have a client who is very conservative and knows I’m an elite, out-of-touch Hollywood liberal,” Mr. Douglas said. “Yet we joke and have a good time. Reading conservative copy makes me laugh. So does a lot of the liberal copy if it’s attacking. Stanley Anderson is different. A 73-year-old voice actor who lives in Los Angeles, he grew up in Montana as a labor-supporting, “dyed-in-the-wool New Deal Democrat” and works exclusively on left-leaning commercials. This year, Mr. Anderson was hired to record a series of ads assailing Mr. Obama. Never aired or made public, the ads were produced by Democrats and shown to internal focus groups to gauge the impact of potential Republican attacks. So what, exactly, did he say? The calls and emails can come at all hours from frantic producers across the country. We need a 30-second radio spot for a congressman in Indiana. Can you do it in 30 minutes? Once upon a time — read: until the 1990s — being a political voice actor meant having to live in the Washington area. That was where the campaign media consultants were. More important, that was where the studios were. Mr. Anderson remembers rushing from D.C. recording booth to suburban Virginia studio, appointment to appointment, in and out of cars and cabs, sometimes visiting the same studio three times in the same day. Many of the voice actors doing political work became friends, if only because they kept running into one another. 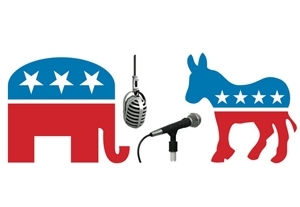 Today, the political voice actor community is largely fragmented, and the pace and volume of ad production have jumped sharply. Digital technology is to praise (or blame): Most actors, including Mr. Walker, have home studios, and spots that used to take up to six days to create and air now take less than six hours. Inside the recording booth, voice-over work remains unchanged. Actors are given scripts. A producer or consultant usually will patch into the call and offer specific directions. You are a concerned mom. You are mad as hell and not going to take it anymore. You are hopeful about the future of the country. Mr. Anderson said that recording a single 30-second spot can require as many as 20 takes. Actors shouldn’t eat before working because sensitive microphones can pick up stomach noises. For the same reason, soft, loose clothing is preferred. Tell that to Mr. Smith. When he first moved to Washington in the 1980s, he went to a department store to buy a television set for his apartment. Within seconds of approaching a female sales clerk, Mr. Smith realized she had a cold.